The product weighs 42 lbs. and may require the use of a lift gate. If you do require a lift gate at your delivery, you'll have the option to add this FREE of charge when you checkout. Compact, lightweight design requires less time to install. Integral junction box simplifies wiring. Exposed coil for easy cleaning. 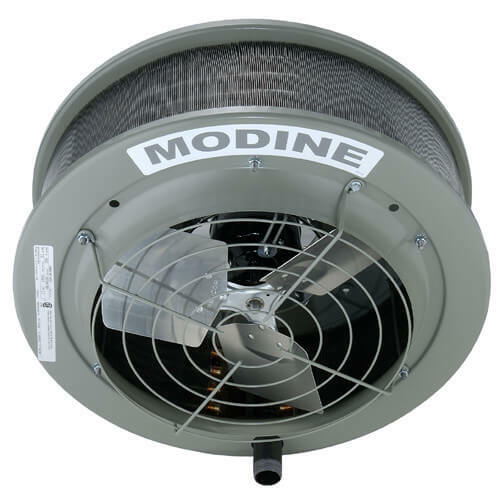 Motor cooling cone protects from coil heat when the fan is not running, and meters a controlled volume of ambient air over the motor to cool it when it is running. Outlet fan guard covers the opening in the bottom of the unit. Relationship between air temperature, velocity, and volume designed for optimum heat throw. Air is delivered to the floor at maximum mounting height, increasing comfort and conserving energy. Model numbers reflect MBH ratings for standard steam conditions, simplifying unit selection. Long life motors with internal overload protection to protect from insulation damaging heat. Quiet operation is assured through the use of carefully selected motors and fans. Casing is treated for corrosion resistance and finished with a gray green baked-on, high solids paint.